Allama Muhammad Iqbal was not just a poet but also a visionary and revolutionary thinker. He was able to see the problems Muslims would face in India once the British left. He proposed the creation of a separate homeland for the Muslims to protect their identity. Occupation of other people’s land is illegal under every law and convention. This rule, however, does not seem to apply to the Zionists and imperialists as witnessed in the recent UN resolution about the illegality of Zionist occupation of the Syrian Golan Heights. No one wants peace more than the people of Yemen led by the Islamic resistance movement Ansarallah. It is the US-backed Saudi aggressors that are playing games. Instead of adopting and living up to the Qur’anic description of being a Muslim or a mumin, many have fallen into sectarian labels that exclude the ‘other’ from their self-designated identity. Those baying for a poor Pakistani Christian woman’s blood accusing her of blasphemy seem to have totally ignored the noble Messenger’s (pbuh) own conduct in such cases. Zionist Israel has once again been taught a lesson, this time in Ghazzah that preponderance of weapons does not always translate into military victory. The Palestinian resistance in Ghazzah has proved this causing political turmoil in the Israeli snake pit. 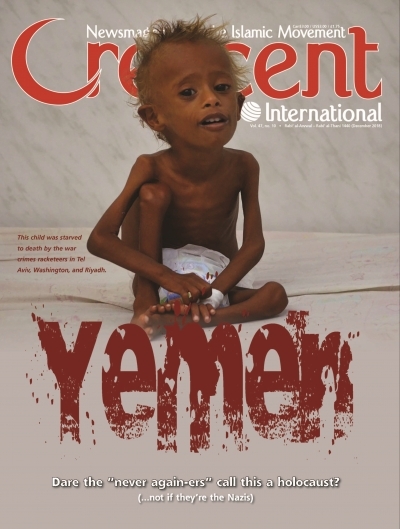 Every 10 minutes a child dies in Yemen because of the total siege imposed by the US-UK-Saudi and their allies. There is also widespread famine, entirely man-made, due to the war imposed on the country. America is the only country in the world that uses sanctions as a weapon of war. The list of sanctioned countries is growing but apart from creating mass starvation and deaths, the Washington warlords have achieved little. The Khashoggi affair has exposed the Bani Saud in a manner that none of their other misdemeanors had done before. Turkish President Erdogan has skillfully utilized the ghastly crime to expose their true nature. Who would have imagined that after waging a 10-year war in Afghanistan, the Russians would be back as mediators and peacemakers in the now US-occupied country. There are various groups in Pakistan that try to use the blasphemy law in the country to advance their own political agenda disregarding the noble Messenger’s (pbuh) quality as a ‘mercy to all the worlds’. The US-imposed sanctions on Iran have largely failed primarily because the rest of the world is fed up with US bullying and blackmailing tactics. Instead of Iran, it is the US that stands totally isolated. Among the Arabian regimes, Oman’s was considered to be following a somewhat sensible policy until the Zionist prime minister was seen hobnobbing with the ruler of Oman, in clear betrayal of the Palestinians! That 911 was an inside job is now becoming widely recognized. Most people, however, have only a hunch about it. In this book, many experts prove beyond doubt that the official version put out by the US regime is total bunk. While Muslims must express their love for the noble Messenger (pbuh) in all circumstances, there is a strange phenomenon at work in Pakistan. The Saudis seem to have a strange fascination with the number 15. Take the brutal murder of Jamal in the Kingdom’s consulate on October 2. These agents of imperialism inflicted a lot of damage on the people of Syria that would take a long time to rectify. Unfortunately many poor Muslims fell for this propaganda and continue to be misled to this day. There can never be peace in a world if it is dominated by a single superpower as was the case until recently.